Tokyo’s five star Hyatt Regency hotel, located next to Shinjuku central park, is a modern landmark with a strong connection to the landscape. 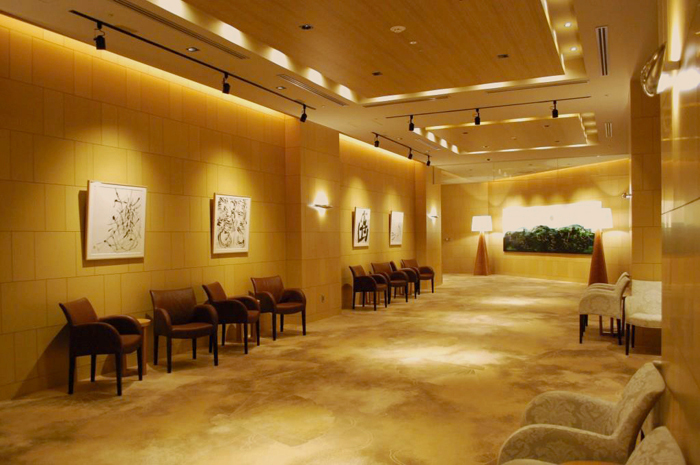 Five pieces were commissioned from Noriko Maeda for modern space of the hotel’s first floor lobby. The pieces constitute a reflection on five distinguishing aspects of Japan’s landscape which, together, inspire a modern and Japanese atmosphere into the vast lobby space. Each theme—Fuij San, Hakone's hydraengae, Japanese Silver Grass, Fuji's Five Lakes, and Cherry Blossom—brings out an essential element of the county’s unique and verdant landscape. While the meaning of each character is emphatically literal, the visual articulation seeks to capture the aesthetic qualities of the landscape, through the lightness and darkness of the sumi, providing an abstract depiction of the landscape and the imbuing each word with a spatial significance. The simultaneity of the word and its spatial qualities evokes a uniquely Japanese perspective of the landscape in the heart of the viewer.